In our Wellness Program , there is something, we go on emphasising again and again, is how “Living in the moment”, help you to achieve the natural state of Wealth and Wellbeing . Wellness Program teaches you Wellness Yoga , which is a natural stress buster for Workplace environment. It is a natural stress buster because, after doing the Wellness Yoga , you recognise the fact that you don’t need anything from outside, it’s all inside you. We have seen how Wellness Yoga is a natural stress buster, when the participants, comes in the end of busy working day, with tension and agitation, and go out with a face of smile and satisfaction. There are some myths we have regarding Workplace Wellness, and it’s important for you to know the reality . And in the Workplace Wellness programs, you come to know more about this Myths and the real facts about them. Workplace Wellness : Myths and Reality # 1 : We are multitaskers .. Are we really ? Now, why do you need the Wellness Program, to live in the moment, while it sound so simplistic and cliché to live in the moment. Yes, it may sound cliché, but it is not easy to practise it in daily life. One of the reasons is, our mind always stays in a default mode, mostly distracted, and engaged in something different, then what it is, into right now. Either it is shifting towards past, in a memory of something good or bad, or it is daydreaming in the future. It is never, in there, right on the moment. With the modern world, this phenomenon becomes very intense, with the technological distraction continuously shifting our focus. We have our phones ringing, chats pinging, emails making noise and, and we feel we have so many things to attend, at a single time. Many people also believe on the idea, that they can multitask. One of my feminist female participant, made a gender division out of it. Her words are like this, ‘you don’t know, we women are multitaskers, you men are not ‘. Well, I wish it would be true from psychological and scientific context, which says that the idea we can multitask, is an illusion as far as neuroscience goes. We really can’t, we can just do one action at a time. We can shift attentions back and forth, but that not multitasking in reality. It is just that, you are fast enough to shift attention. You are still doing one action at a time, with a high probability of being stressed out , due to mind continuously shifting its attention back and forth . Workplace Wellness : Myths and Reality # 2 : Attention deficit equals to Attention Deficit and Learning Disability Syndrome. No it doesn’t equals to Attention Deficit and Learning Disability Syndrome. Attention Deficit in Workplace is not Attention Deficit, and Learning Disability Syndrome. Attention Deficit is just somewhat similar to loosing the track of mind . Are we aware, what we are aware in the mind right now? Well, most of the times we are not. In our Workplace Wellness Corporate Training Programs, we teach this Wellness Yoga, and then people becomes aware about where there mind is right now. So it’s not an psychological dysfunction, it’s just happens because of the too many distraction in today’s workplace environment, that one cannot concentrate in work, and don’t perform well. Now, we cannot straight away leave this distraction, like you cannot switch the mobile off, or put the computer off. It’s not possible, because they are so much the part of the work you do in modern workplace. So what you can do is, that you can be aware of them and continuously put an effort, to bring the mind back in the moment.That’s why you need to learn the Wellness Yoga in Workplace Wellness Program. Workplace Wellness : Myths and Reality # 3 : We can do this “Living in the moment “ stuff all alone , and we don’t need Sri Joydip Ashram Workplace Wellness Program for that. I am sorry to say, but you can’t. See, our mind always remains in a kind of default mode of wandering or daydreaming, or moving to a memory, or fantasying about future. For this we have already build a neural pathways, which have got embedded in our brain system. We do need an extra effort to build new neural pathways, required for a new habit of mindfulness shifting from the default mode of absent mindness. Neuroscientist, say that to build a new habit, you need, to have new neural pathways. That’s not possible without practise of Wellness Yoga, which we teach in Sri Joydip Ashram Workplace Wellness Program, which helps you to build a new habit, of becoming aware to live in the moment, and discarding the habit of being in default mode. 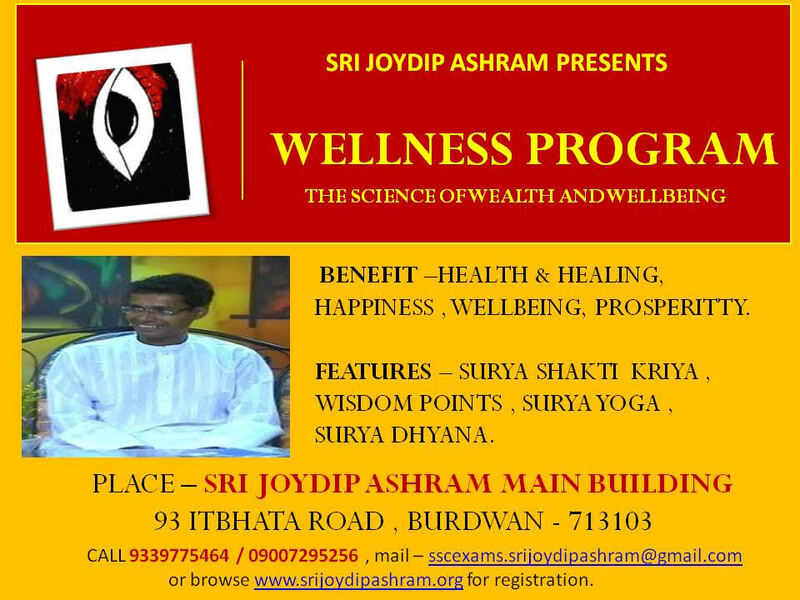 And there are many details about them along with 4 more Wisdom points which you learn , while you join the Sri Joydip Ashram Workplace Wellness Program. Workplace Wellness : Myths and Reality # 4 : We have been doing our work for long time without Workplace Wellness Program , why do we need you now ? Yes, you are doing your work for long time without Workplace Wellness Program. But its a myth, that you are doing it without us. You might be doing it without our programs being conducted in your workplace, but you are never doing it without the teachings of the program. This teachings of “living in the moment” and the art of mindfulness by ‘Wellness Yoga’, you are practising unconsciously , for getting to state of Workplace Wellness , and might be unleashing a little bit of your potentiality .And now with the Workplace Wellness Program, right in front of you have possibilities to unleash your true potential .